Good idea, but there’s something even more important. Yep, I’m not talking about consuming words to understand a story or to grasp an argument. Let me explain what reading means. As a creative side-project I’m currently learning how to draw cartoons. I’ve never had any artistic talent. I’ve never been able to draw. I even struggled with a simple stick figure. But you don’t just trace and copy. Instead, you learn how a figure is built up from simple shapes. Learning to draw means learning to see. For 10 weeks I’ve been working on circles. I’ve learned to see the circles that create a cartoon figure. Some circles are small, some large, some are more like ovals, but it’s amazing how much you can draw with simple circles. With writing and blogging it’s the same. You need to learn how to detect the basic shapes – how words, sentences, and paragraphs are assembled to create inspirational blog posts. You need to analyze structures, paragraphs, sentences, and words. You need to find out what grabs and holds your attention. Discover how word choice impacts your emotions as a reader. Notice the things that are left unsaid. For some time you may even lose the joy of reading, because you can’t read leisurely anymore. You can’t read without picking paragraphs and sentences apart. Once you start analyzing texts, you start to detect various post structures. You notice how long paragraphs with undulating sentences are broken up by staccato-like sentences. You learn how specific words help you feel or visualize something. We like to worship our heroes. We think that they’re gifted, that they’re so much more special than we are. But are they born with a talent to write epic blog posts? Or have they worked hard to hone their writing skills? Could it be that they’ve spent many hours reading and analyzing, and criticizing their own writing until they’re finally happy with the results? In her book Mindset. How You Can Fulfil Your Potential Carol Dweck describes two different mindsets. People with a fixed mindset believe they’re born with certain talents. What they can and can’t do is already determined. Success for them is proving how gifted they are. People with the growth mindset, however, believe that basic qualities can be cultivated, stretched, and improved through effort. They thrive on challenges and learn from their failures. Failure isn’t a sign that they lack talent, but an opportunity to learn more. Some people may have more drawing talent than me. They don’t draw so many misshapen Snoopies. They don’t screw up when they draw Sid of Ice Age. They may learn quicker. But if I persevere, I hope to get there, too. Maybe one day I can even illustrate my blog posts. To create a successful business blog, you don’t require any special talent. Analyze why you like certain bloggers. Read, and read, and read more. Learn why some blog posts are boring as hell, and why others fascinate you and keep you waiting for the next update. Forget about talent. Don’t think about creative skills. Stop telling yourself that others have more talent than you. Instead get to work. Read more. Learn more. Write more. 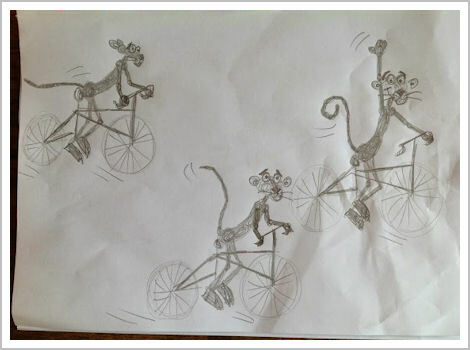 I’ve practiced long and hard to draw a Pink Panther on a bike. It was hard to get the dimensions right! Once again a refreshing blog post illustrated by snippets of you and your life – and your own illustrations! That’s it, you’ve illustrated your own blog. Henneke, What whelmed me is your passion. It leaps out at me, especially in this generous giving of you. Very fortunate to be on this here planet with you and your other advocates at the same time. Loved this post! I find myself rereading blog posts and advertisements obsessively if it really pulls me in. I also find it helpful to analyze copy I don’t like and figure out what needs to be changed. That exercise has helped me edit my own writing tremendously. Yes, I agree with you. Talent does help, but it doesn’t mean that talented writers don’t have to put any effort into learning how to write better. They may be gifted, but they still have to practice hard. They may simply learn quicker than people who are less talented. Daniel Coyle hasn’t quite convinced me either ;-). Carol Dweck’s view seems a little more nuanced. What I mean is I think some people have a great curiosity and motivation to learn a specific skill – probably because their brains are extra suited for learning that skill. You might as well call it talent. Even if Sean d’Souza does not agree. Because in Coyle’s book the main factor that decides success is motivation. And the motivation in talented people is there because they love doing that thing, because the CAN do it more easily, because it is their preferred language. Be it visual or textual or a motor skill or whatever. Carol Dweck would say this motivation is determined by whether you have a growth or a fixed mindset (she also argues that you can work to change your mindset, but that’s a different story again). When you have a fixed mindset you’re not motivated to practice and take on new challenges, because you think if you have the talent, you should be able to draw or write effortlessly (that’s how some people waste their talents); and you also think that if you don’t have the talent, it’s no use to practice, because you can’t do it anyway. Carol Dweck also acknowledges there’s often some innate ability which makes it easier to learn something. That’s probably what you call a preferred language. It’s a fascinating area of study which could be debated endlessly of course. Geoff Colvin’s book (Talent is Overrated) is also quite interesting. What nonsense – fixed mindsets, growth mindsets.. it’s all marketing speak with no substance. All that means is: if you think you can learn, then you can. If you think talent is a given, you won’t try. I just found you after reading your newest book. Your take on writing web copy and blog content is the best I’ve found! I believe in the growth mindset. I believe that if you have the passion, the determination, and learning the right techniques, you can become good at anything. I’ve certainly learned a lot about copywriting by following your advices and tips on this blog. My copywriting skills have improved a great deal! The theme is Prose (StudioPress) and the fonts are Cabin Condensed (logo, headlines and subheadings) and Georgia (body text). Glad you like it! Yep, isn’t it wonderful to have many opportunities to learn? Hi Henneke, I love your illustrations and the theme of this article. I took up art several years ago as a way of exercising my right brain. I figured it would be a good way of becoming more creative with my work. And it has. Not to mention I love my Friday life-drawing classes. I loved this post! Thanks so much for it. I fall into the growth mindset, though I never thought about it before this article. I have been blogging for about a year. I can see how I have changed as a result of emulating styles and techniques from other bloggers. I am currently struggling with engagement, which you have exceptionally demonstrated here. I also have the growth mindset in most respects, but not in all. I’ve thought for a long time that I couldn’t do certain things because I didn’t have sufficient talent for it – like drawing or music or even writing (I changed my mind on the latter only a couple of years ago). Creating engagement is hard work, and it often starts with generating more traffic, which in turn means building an email list. Let me know if you have some specific questions I can help with. 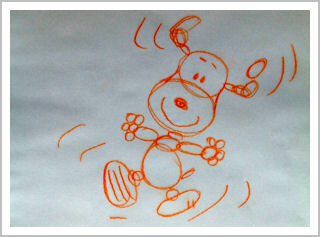 Thanks for sharing your cute drawings with us, Henneke. You obviously have a talent for drawing as well as writing. Thank for your brilliant posting. You discovered some points simply, but the contents of this are not simple, even extra-ordinary. You found something that we don’t get very often, and this is the prodigy of a writer. I tried to be a writer many times but I was not succeeding in my pursuit due to lack of the creative mind. I do believe that i have no innate ability. What is your perception? You might not become a bestselling novelist without a special talent, but with hard work you can become a good content writer. It might not be easy, but if you’re prepared to put in a lot of effort because you really want it, then you can do it. Great writing, Henneke. I have a ‘growth mindset’ and I strive each day to improve myself. I love the way you use such short sentences in your writing, all so naturally. 🙂 I still struggle to break lengthy sentences each day. I usually work hard to shorten my sentences when editing my text. Words like and, but, or because show where a sentence can be broken in two. It also helps me to write as if I’m having a conversation with my reader (like in the opening of this post). And I’ve stopped worrying about writing complete sentences – some of my “sentences” are just phrases. My high-school teacher would get angry with me! Your blogs on writing better are really helpful to build clear perspectives. After reading your article about ways to improve your writing skills, I couldn’t stop myself but come and read this one. I have been writing since a long time. It was something I loved doing. I loved putting in different stories and different types of content. People loved it. Or I should say my family and friends loved it. I did it so regularly that it ultimately turned into a full-time work for me. But there’s this feeling which makes me think that I don’t write for the love of writing, not anymore. For me, writing has become just work. Maybe I stopped putting in efforts into my writing. I just write and write and write. That’s bad. No? I am looking for ways to get out of this horrible pit where I don’t enjoy the thing I used to love so much. I want to write better. I need to find out how. Your articles are certainly helping. Is there something more you can suggest me that you think can help? Are you writing on auto-pilot? It might mean you’re missing a challenge. What can you do to make writing a fresh challenge so it’s more interesting again? Can you challenge yourself to write in a different format or experiment with a new writing technique? Can you write about a different topic or write more in-depth? Can you experiment with your writing voice? You might need to feed your creative soul a fresh challenge, so writing doesn’t feel like a production process anymore, and you can find back the joy of writing a beautiful sentence or discussing a challenging topic. I just came across this website a couple of days back and you have influenced me to the core. I’ve started taking notes out of your writing. I’m imagining, because your content is vibrant and crisp at the same time. It gives me mini stories to relate to, and being a poet, it rhymes to me as well. I hope you know what I said in the last line. Cheers. Thank you for inspiring!! While reading the paragraph describing the people with a fixed mindset, I felt like something really shifted into place within me, for I realised that I am, as a matter of fact, one of those people. But I strive to change that. Any tips on how I could achieve that? In her book “Mindset: How You Can Fulfil Your Potential,” Carol Dweck argues that learning about and understanding the growth mindset can already lead to a big shift in how you think about yourself. You might want to start with reading her book. I found it enlightening and inspirational. This article will make a difference in my reading and writing in going forward. Your content is in a simple and effective format. Much gratitude. Thank you for your lovely comment, Amelia. I appreciate it. Happy writing! I love your analogy of learning to draw cartoons with learning to copy from the writers you admire. People like to think some are born with an innate gift for writing because it gives them an excuse to not bother doing the hard work. They can stick their head back in the sand and believe they are not gifted, or they can make the time and practice practice practice. Yes, exactly. Sometimes it feels easier not to try. But life becomes so much richer when we pick up the courage to try and do the hard work to get better. Thank you for stopping by, Sandra! I appreciate it. As if all is right in the world, I’ve stumbled upon your delightfully charming array of creative writing resources! You’ve sparked a fire within me–even this very comment has creative edge it wouldn’t have had otherwise. I had to tell you. And I must ask – What in the world are you up to today? Thank you for this legacy and your growth mindset that helped explicate it for us. I’m still continuing to write and draw!